The 16th Annual World Congress of SBMT will bring together physicians, scientists, policy makers, funding agencies and industry to further the advances and applications in brain and spinal cord mapping and image guided therapies (operative and non-operative). The conference will take place at the Los Angeles Convention Center, March 15th to March 17th 2019 in theLos Angeles, California on the West Coast of the United State of America. We encourage you to come and visit the annual conference which will host a world class program across the three days, an exhibition hall, poster displays and plenty of networking events. We encourage you to come and visit the annual conference which will host a world class program across the three days, an exhibition hall, poster displays and plenty of networking events. The North American Spine Society is accredited by the Accreditation Council for Continuing Medical Education to provide continuing medical education for physicians. The North American Spine Society designates this spine session of SBMT (Didactic sections only) for a maximum of 15 AMA PRA Category 1 Credits™. Physicians should claim only the credit commensurate with the extent of their participation in the activity. In recent years astonishing advances have contributed to amazing discoveries and breakthroughs in fields of neurology, neuroscience, neurosurgery, radiology, engineering, computer science, nanotechnology, medical imaging, medical devices and cellular/stem cell therapy. Society for Brain Mapping and Therapeutics controls the content and production of this educational activity and takes every step to ensure the presentation of balanced, objective information. In accordance with the Standards for Commercial Support established by the Accreditation Council for Continuing Medical Education (ACCME), faculty, abstract reviewers, paper presenters/authors, planning committee members, staff and any others involved in planning the educational content (and the significant others of those mentioned) must disclose any relationship they or their co-authors have with commercial interests which may be related to their content. The ACCME defines "relevant financial relationships" as financial relationships in any amount occurring within the past 12 months that create a conflict of interest. Each section of the SBMT has been accredited by a different provider (please above). Therefore, we recommend that financial disclosure to be done in accordance with each provider's guides. Understand and discuss the roles of governmental agencies, foundations, and industry upon research and development of the field. Annual Meetings of SBMT are world-class scientific events designed to have a significant impact on cross-disciplinary flow of information/ scientific advancements. Attendees are a mixture of neurosurgeons, radiologists, neurologists, psychiatrists, rehabilitation medicine, cardiologists, oncologists, bioethicists, policy makers, government officials, engineers, physicists, neuroscience, stem cell scientists, Bio-technologists, nano technologists, computer scientists, allied healthcare professionals, healthcare executives, students, post-docs, residents and fellows. The SBMT Annual World Congress is a multi-disciplinary forum designed to facilitate cross-disciplinary dissemination of technological and medical advances and scientific discovery. The program committee and session chairs/co-chairs will enforce the available time in order to keep sessions on schedule. Any speaker who has not submitted their form, had it reviewed, and managed any conflicts of interest identified by SBMT will not be able to speak in a CME-certified session, and may have to be removed from the program. These must be actionable: what will learners be able to do differently as a result of your presentation. What are the most tangible result of your research (publication, award, clinical trial, change of practice etc. ), if any. These point need to be in your first few slides. Disclosure information must appear on your first slide. No commercial logos are permitted on slides, handouts, or any other educational materials. An abstract or syllabus contribution required for each CME accredited presentation. 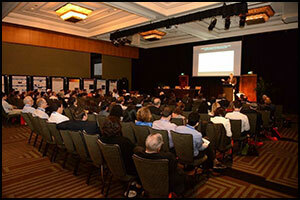 Abstract is not necessary for the none CME accredited sessions/presentation. A sample can be found by Clicking Here. The format can be either in MS Word or PDF. Ensure that each author has completed their Financial Disclosure and submit it for review. And a concise abstract of less than 500 words. You are encouraged to send the abstract as soon as possible. A Gap Analysis is needed for each CME session (prepared by session chair(s)). This program is jointly sponsored by Cedars-Sinai Medical Center, City of Hope, LLU and SBMT. PLEASE NOTE: We will load the talks ahead of the time to the local computer. Please identify your name and the session you are in. This will avoid long delays. If you need any special arrangement please let Bryan know ahead of time.